The Code of Federal Regulations 10CFR 50.55a requires all commercial nuclear power plants to inspect the entire surface area of the containment building - internally and externally in accordance with ASME Section XI Subsections IWE and IWL. A novel remote visual inspection system was developed and deployed to allow the viewing and cataloging of ~12,000 square feet of the inside steel liner surface from a distance of 55' with variable magnification to meet the general, VT-3 and VT-1 ASME Code requirements of IWE. A general visual examination as required in the ASME code Subsection IWE is an examination that will detect areas of degradation as determined by the utility's RPE (Registered Professional Engineer). At Ginna Station it was determined that a lower case character size of .174" was required size needed to detect unacceptable degradation. The lower case character size requirements per ASME Section XI are .105" for a VT-3 and .044 " for a VT-1 examination. A semi-automated PC-based system with a mega-pixel digital imaging front-end and 132:1 ratio power zoom lens allows high-magnification, high-resolution, 4-megabyte image files to be databased for future random access, mapping and comparison. 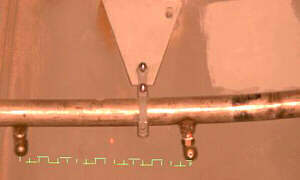 Since the early 1970's commercially available borescopes, fiberscopes, closed-circuit television (CCTV) cameras (see Figure 1) and videoscopes have been successfully applied to a very wide range of industrial inspection tasks at refineries, chemical plants, fossil and nuclear power generating stations. As a spin-off of the medical instrument marketplace, industrial remote visual testing (RVT) has adapted and modified medical probe technology for suitability in this fast-growing commercial sector. However, in the technical transfer of medical hardware to the larger-scale applications of industrial plants, it is apparent that a scaled-up approach is sometimes needed. Additionally, over the past several years, visual testing/remote visual testing (VT/RVT) has been professionalized as an official nondestructive examination (NDE) discipline through ANSI (American National Standards Institute) and ASNT ( American Society for Nondestructive Testing) qualifications, testing and certifications, and many industrial facilities are dramatically increasing the use of RVT. Rochester Gas & Electric's Ginna nuclear generating station, located in Ontario, NY on Lake Ontario, is a 490 Megawatt single-unit plant. It contains a Westinghouse NSSS (Nuclear Steam Supply System) consisting of a pressurized water reactor (PWR) and two steam generators. The concrete containment structure is >30 years old and has a steel liner on the inside which is painted. (See Figure 2.) In order to apply RVT to the Ginna containment dome inspection, in any practical, time- and cost-effective fashion, the technology needed to be scaled-up. Conventional video technology is fundamentally limited in vertical and horizontal resolution to 480 x 640 (~300,000) pixels due to bandwidth limitations and the EIA-170A CCTV standard (Electronic Industry Association Color Composite Video Standard). If conventional 480 x 640 CCTV technology were to be used, a maximum inspection scene size of only ~2 square feet would have been realized. This scene size is dictated by needing a system magnification high enough to resolve the smallest detectable defect, the equivalent of .174" lower case character size for the General Visual examination. If the General examination identifies indications then a more detailed VT-3 or VT-1 examination would be required. This would have required ~7,000 images to be viewed, qualified, captured and stored. A better approach was needed. To perform this examination efficiently, more imaging pixels were needed so that the scene or inspection target size could be increased proportionally without compromising the minimum detectable defect size. Electronic imaging devices were researched in the 1.0 - 2.2 million-pixel ranges and was able to source a suitable digital, solid-state color camera with 1,300 horizontal x 1,000 vertical (1.3 million) pixels. The digital imaging camera, with a system update rate of 12 frames per second, yielded approximately 4 times as much resolution as CCTV and, therefore, could interrogate 4 times as much surface area with the same resolution as CCTV. The 1.3 mega pixel, PC-based approach was chosen for this task allowing the entire 12,000 square feet of surface to be inspected with only 1,253 images in approximately 1/4 the time with less image storage onto the PC's hard drive or CD ROM's. Additionally, digital imaging yielded loss-less transfer of the test data to the CD storage medium compared with analog video, which would require A/D (analog to digital) conversion. Since the time window for the entire inspection was predicated on having exclusive and uninterrupted use of the plant's overhead crane, time was of the essence. The plant's refueling schedule allowed a 40-hour window for the inspection to occur from the overhead crane trolley platform. In order to keep the image size and format consistent, it was decided to position the camera in the center of the hemispherical dome which made it ~55' away from all surfaces to be inspected. With a scene size of ~12 square feet (3' x 4'), the framing angle needed from the lens was 3 degrees at 55', yielding a general inspection with 0.174" lower case alpha-character acuity. This resulted in the need for a broadcast-type EFP/ENG (Electronic Field Production/Electronic News Gathering) lens with focal length of ~1,000 mm. 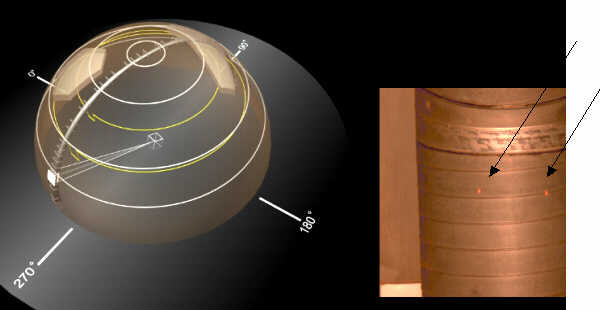 Additionally, if questionable indications were found during this general inspection, a more detailed VT-3 (.105" lower case alpha character size) or VT-1 (.044" lower case alpha character size) would be required with target sizes of ~2.0 and 0.5 square feet respectively, and lens framing angle of 1.5 and 0.7 degrees respectively. System acuity of 0.105 and 0.044" lower case alpha-character was achieved for VT-3 and VT-1 respectively. Therefore, a 132:1 zoom ratio lens having a wide-angle focal length of 20 mm and fully-zoomed focal length of 2,600 mm was utilized for this task. Two each, 750-watt focussed quartz-halogen lights were attached to the camera housing. Two each 5 milli-watt solid state (red) lasers provided a fixed spatial calibration reference on the containment dome surface for scene scaling (via the zoom lens) and subsequent pixel calibration for measurement purposes. An industrial-grade tripod base was used to position the camera, P&T (pan and tilt), etc. on the overhead crane floor. See Figure 3. Since a PC was to be used to control the digital camera and store images on its hard drive, it made sense to also use the PC to control the camera's P&T position and automate the panning and tilting of the camera, lens, lights and lasers. A custom program was written which would automatically calculate the pan and tilt index angles in degrees, based on the operator inputting the number of images needed to cover a 360º pan arc or 90º tilt arc including a 10% image overlap. A map with image serial numbers was used to help the operators track the inspection progress. See Figure 4. A PC with the same software was used for the IWL examination. This software was modified to capture the images from the digital camera and store them into the proper image files. Automatic image capture was realized by the operator simply by hitting the space bar after viewing and accepting an image scene as being indication-free. Images which have potential indications would be tagged by the operator for further review and analysis. The software program automatically sets up image file names based on the camera's pan and tilt index position. Automatic image capture was realized by the operator simply by hitting the space bar after viewing and accepting an image scene as being indication-free. If an image had an artifact in it, the operator would tag the image file with an "X" to alert further review and analysis. After each complete pan pass of 360º, the image files would be backed-up onto CD's for secondary review and analysis at a data station outside of the containment building. The configured inspection system was installed on Ginna's overhead crane on 3/22/99. Actual inspection work commenced on 3/22/99 at 8pm and was completed on 3/23/99 at 7am. In all, 1,253 images were taken in 11 hours. Total inspection time including set-up, calibration taking images and tear down was 27 hours, allowing spare time for taking additional, higher-magnification images at suspect locations. Figure 5 shows a typical image taken at 55' distance. Following the very successful inspection of the Ginna containment building dome steel liner, RG&E's NDE department asked for the 1,253 image data files be mapped onto a 3-dimensional model of the dome. A custom program was written to accommodate this request and now serves as the interface to randomly access individual images. Figure 6 below shows this 3-D map and a sample image accessed from the 3-D database. Additionally, the utility has decided to use the same imaging system and data capture protocol for the containment building external surface per IWL's VT-3 requirements. See Figure 7. IWL examinations include all accessible concrete areas on the outside of the containment building and could be performed while the plant is in operation so there were no time restraints except for weather. Several physical obstructions (e.g. other buildings, steel structures, equipment, etc.) required the camera to be within 3 feet of the surface to be examined and the hardware that was used for the IWE examination needed to be modified. The camera used for the examination had a wide-angle, low-distortion lens, allowing a scene size of ~3 1/2 square feet. System acuity of 0.105" and 0.044" lower case alpha-character was achieved for VT-3 and VT-1 respectively. IWL required four each 100-watt independently controlled lights that were attached to the camera fixture that would allow the operator to adjust the intensity to overcome shadows from external conditions. Two solid state (red) lasers provided a fixed spatial calibration reference on the containment concrete surface for scene scaling. The inspection system was installed on the Ginna concrete dome in late October and all images of the dome area (in excess of 6000 images) were taken by mid-November. This includes set-up, calibration, examination and weather delays. 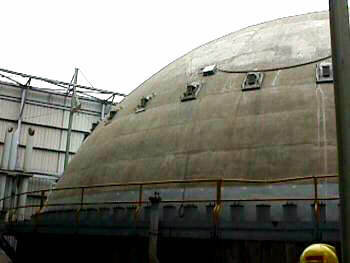 A successful examination of the outside concrete containment dome is the only portion of the IWL examination that is complete as of this time. Additional work to complete the scope of IWL (~10,000 IMAGES) work will be started again in spring of 2000. The inspection of the Ginna dome has not revealed any rejectable indications as of this time. RVT is scalable. By increasing the lamp intensity, camera pixel count and lens focal length, remote viewing of 1 - 10 square foot surface areas at distances of 50' - 100' is achievable. A semi-automatic approach to scanning (panning, tilting) while capturing the digital images for subsequent analysis, archiving and 3-D mapping, also speeds the inspection while minimizing operator fatigue.